Brace yourselves, UK folk: Martin, in collaboration with UK distributor Westside, is releasing a pair of new X Series models exclusive to the sovereign state: the 000X1SAE and DX1SAE. Both acoustic guitars are notable for having sapele tops, combined with modern X Series build and design, HPL back and sides, delmar pickguards and Custom Edition labels, as well as Fishman Sonitone electronics and Martin's SP Lifespan strings. 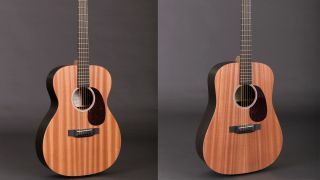 The differences lie primarily in the body shapes: the 000X1SAE offers Martin's classic 000 outline, while the DX1SAE adopts the dreadnought silhouette. The 000X1SAE and DX1SAE are available from UK Martin dealers now for £599.